Create a Great Mobile Experience with CATALYST® and Attendify®. Your conference app plays an important role in creating a positive event experience. Attendees expect a mobile app that makes networking easier, provides up-to-date information and offers instant access to the session content that is most relevant to them. Our CATALYST abstract management system works seamlessly with the Attendify Event App, making it easier for you to offer an app with the most popular features. When you pair CATALYST and the Attendify app, we’ll create a mobile experience from your final program content, and you won’t have to lift a finger. Offer a full conference schedule, speaker bios, sponsor & exhibitor profiles, GPS-enabled venue and exhibit maps, and more. Help attendees navigate your event and build a schedule of the sessions they plan to attend with the personal itinerary builder. Increase engagement with an event-specific social timeline. Attendees can interact with their peers, staff and other registrants. 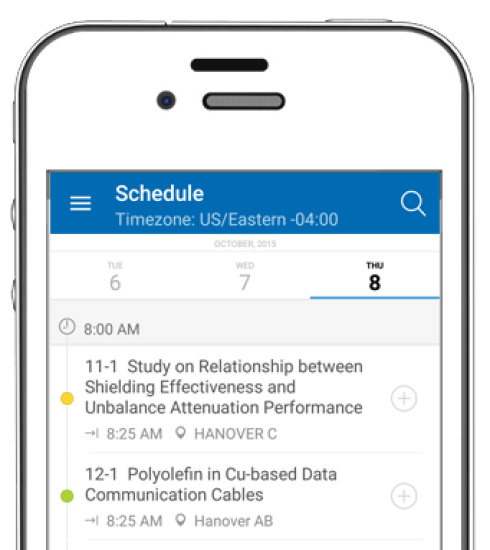 Provide mobile access to speaker materials and handouts so attendees can review a recent session or preview the next one. Give attendees the ability to connect with others while keeping personal data—such as email address and phone numbers—private. Offer native iOS and Android versions, as well as a web version for other devices, to ensure everyone can take advantage of the app. Find Out How Easy Creating a Conference App Can Be. Provide a more user-friendly way to search and access speaker materials, handouts, papers and presentations before, during and after the conference. Offer online access through a simple link, or distribute an offline version as a downloadable file or on a branded USB or DVD.